My mom was so excited to receive the wishes from you all. She conveyed her heartfelt thanks. Thank you guys for all the wishes you showered on my mom. I'm proud to have got so many lovely friends around me. Now coming to today's recipe, I'm sharing a recipe that I tried from a wonderful blogger. Starting from today, I'm gonna post every Friday the dishes I tried out from other blogger friends. Most of the times, we prepare something that we really love from others, even we photograph them but never post the dishes or talk about them. So, I want myself to be bit organized hereafter. I've already posted Mahima's Chocolate Peda, a month ago. I found this recipe in "Think Spice, Think Poppy Seeds" event round-up. This recipe was posted by RV of "Food for 7 stages of life". She hosted that event. I prepared this as a side-dish for Idly. It tasted so good. I mailed her and thanked her for this wonderful recipe. It didn't take much time to prepare. Thanks RV for the quick, easy and tasty sambar. Get RV's Dhikida Sambar recipe here. I'm so happy to receive wonderful responses from you for the first Guest post. My sister is so happy and she conveyed her thanks to you all. Coming Monday, we have another guest. She is one among our lovely foodie bloggers. She is such a friendly person and she got quite a good number of recipes in her blog in a short time. Let me meet you all with our Guest on Monday. Any guess about our guest guys?? How a good idea to post other blogger's recipe that you tried on certain day, I might consider to follow you..
Sambar really sounds great. I am also like to try other bloggers recipe and post it in my blog and thank them for sharing the recipe.Nice idea yaar. You have an award at waiting for you at my blog. Hi. I read ur comment, and have answered it in my blog. I had read this post and bookmarked it too. Hi nithu,belated b'day wishes to your mom dear.Amazing presentation of every dish,it's a good thought of experimenting others dishes n thanking them in return.Idly looks so tender n sambar compliments it a lot. the sambar looks yum and delicious. Tempting sambar nithu..perfect with that soft idili. 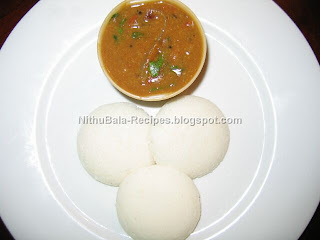 i love those idlis.. so soft and fluffy. sambar is new to me.. sounds interesting. thanks for trying the peda nithu. i am surely trying your sister's fruit halwa. Thanks for trying my recipe Nithu. I am glad you liked it. Looks very tasty dear !...yummy combo! wil send my entries before 31st. nice sambhar recipe..waiting for the guest post on monday, I too have similar guest post day every Wednesday on my blog.. Thanks so much for your submission to my event! It looks great. This also seems fantastic...I love poppy seeds!